Q. How do I find an article that is scholarly or academic? These are words used to describe the types of sources you may be required to use in college. Author and author's affiliation are always listed. Article uses technical, specialized vocabulary. Article reports on experiments, studies or literature reviews. Article uses graphs, tables, data. Article always includes footnotes or citations. See the LibGuide linked below for more details on determining what type of source you have. 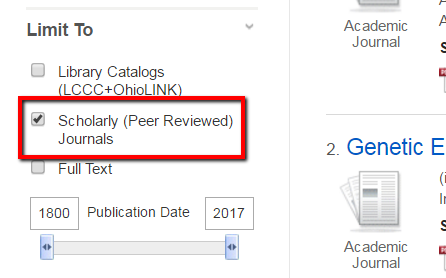 Use the OneSearch box on the Library's home page. Consider limiting to Scholarly (Peer Reviewed) by using the checkbox on the left hand side of the results list. For more details on Finding Articles, see the LibGuide linked below.